According to the World Bank, empowerment is the process of increasing the capacity of individuals or groups to make choices and to transform those choices into desired actions and outcomes. Our goal is that the work of Collective Humanity will help pave the way for a more sustainable and independent future for communities living in vulnerable situations around the world. We facilitate empowerment for the communities we support by providing dignified employment opportunities, access to quality education, vocational training, and community support programs. We want at-risk communities, throughout the developing world, to be empowered with a strong foundation of economic opportunities, education, and community support, from which they can choose their future and transform their lives. We are not here to change their lives, we are here to help them change their own. We believe access to education is a fundamental human right. We aim to help the women we partner with receive access to a full, comprehensive education. We facilitate a scholarship fund for our partners and their children to attend mathematics and literacy classes in an effort to help break the cycle of poverty and enable self reliance. We have recently established a scholarship fund specifically for our artisans children. The cost of sending a child to school in Cambodia is often too high an expense for our weavers to take on, so while we build demand for their products, we will be covering all expenses of sending their children to school. 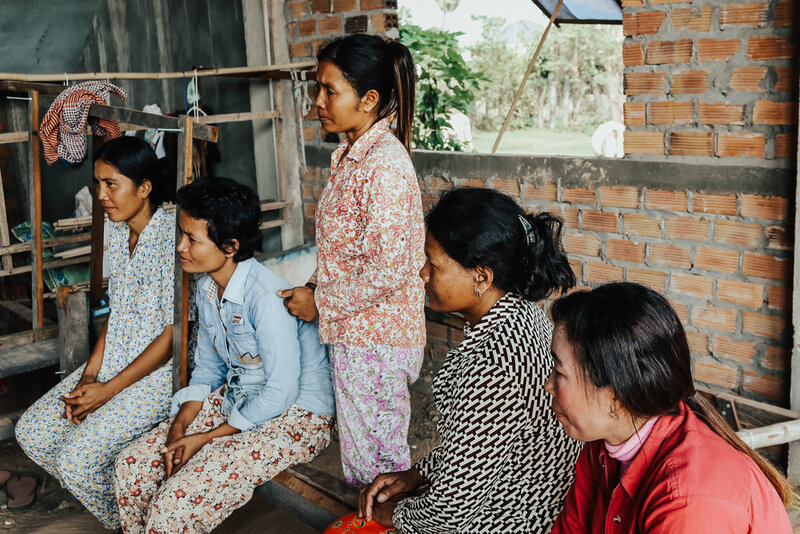 At Collective Humanity, we believe the most sustainable way to truly empower entire communities to rise above poverty is by providing women with jobs that enable independence and self-reliance. We believe that providing women with safe dignified work, where they have room to learn and grow, is the best way to ensure sustainable economic growth. We want to empower our artisan partners to be successful female entrepreneurs and enable them to sell their products to a global marketplace. We work with our artisan partners to co-design high quality, on-trend products to help maximize their earning potential. We provide 50% upfront for all of our artisan made goods to ensure the artisans always have stable income. Through our online platform and in-market opportunities, we are able to sell our artisan made goods to a larger supply chain and maximize earning potential for the women. We believe in the power of community. We help facilitate communities for our women and their families to come together, celebrate their journey's, and share in their struggles. Our community support program includes everything from bringing in alternative healers to lead Reiki Courses for women in need of deep healing, to a community emergency fund. We believe the more supportive the environment, the more likely these women are to thrive. We believe in frugality and in maximizing the potential impact of your contributions, and our efforts. We maintain a strict budget with very little overhead and currently allocate 15% to administrative expenses. That means the majority of your money is going directly to our programs for the girls, where it is needed the most. As always, feel free to reach out for more in-depth information or just email us to say hi! Our Executive Director would love to speak with you personally, so feel free to email her at kate@collectivehu.org.